As we have addressed in a previous post, Surprise! Another Change in Local Search Rankings, Google determines local rankings based on relevance, distance and prominence. Relevance is determined by how well a local listing matches what someone is searching for. Distance is self-explanatory and focuses on how far a result/listing is from the location of the searcher. Prominence refers to how well known your business is, this is where reviews for Local SEO come in. Prominence is based on information that Google has about a business from across the internet, this includes links, articles, directories, organic search ranking, etc. One key aspect of prominence is Google Reviews. Your Google review count and score are factored into local search rankings. Therefore, more reviews and higher star ratings will most likely result in an improved position in the local search results. In addition to improving your local search ranking, reviews also help increase customer trust and influence decision making. 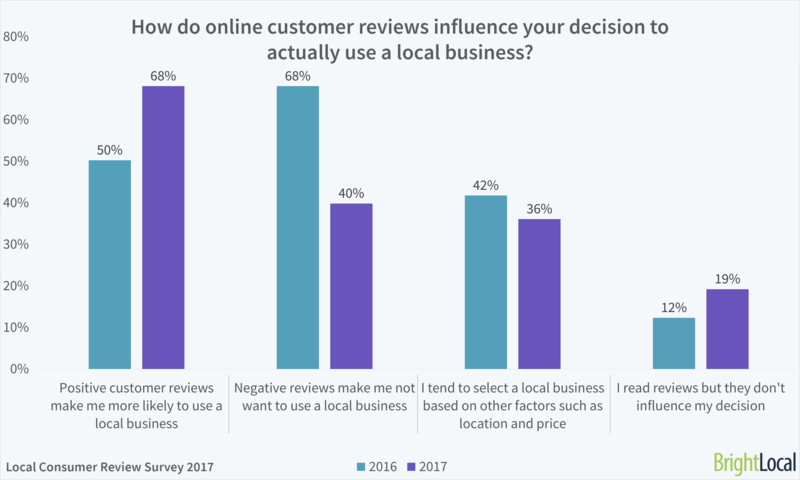 In a study by Bright Local, it was found that 97% of consumers read online reviews for local businesses in 2017, with 12% looking every day. Additionally, that study found that 68% of US consumers said that positive reviews made them more likely to use a business and reading negative reviews makes 40% of consumers not want to use a local business. For these reasons, it is important to continue to work to gain positive reviews and address negative reviews to ensure the problems are solved to prevent future negative reviews. Customers also take into consideration the age of reviews in determining their trust in that review. The BrightLocal, Local Consumer Review Survey found that 77% of consumers think that reviews older than 3 months aren’t relevant. This means businesses need to continually work to gain reviews on an ongoing basis. It isn’t a one and done process when it comes to securing user trust. As they say, ask and ye shall receive. Asking for reviews, in the right way is the best way to get more reviews. In fact, according to Bright Local, 68% of consumers left a review after a business asked them to, while 26% of consumers reported that they had never been asked to leave a review. Businesses are missing out on a potential 26% more reviews just by not asking. As you work to gain online reviews for your business, we recommend focusing your attention on Yelp, Facebook and Google as these are the review platforms most trusted by users as well as the most frequently used. Yelp is the review site of choice for 20% of consumers, Facebook is also favored by 20% of users and Google is most trusted by 16% of consumers. Ensuring that you continually work to build reviews on these three platforms will not only help to improve your local search rankings, but also improve user trust and ensure that you have a positive representation of your business when potential customers are researching their options. Below you will find recommendations and best practices for gaining reviews on Facebook, Yelp and Google. The person-to-person request is incredibly effective, particularly if the requester has spent a lot of time with the customer. The person with the deepest relationship with the customer is likely the person who should be asking for reviews. You’d be amazed at how many customers don’t realize how important reviews are for businesses today. Create a one-sheet or how-to tutorial that educates them on how to leave feedback and where it can be posted. Whitespark offers an excellent Review Handout Generator that allows you the quickly and easily create a handout with instructions on how to leave a review. You may consider sending out an email to customers that have had recent, pleasant experiences with your business and ask them to write a review. If you do this, make sure you specify where you would like them to review your business. We recommend only asking for reviews for Google or Facebook as Yelp discourages asking for reviews. Have the email written as a personal request from that same person, you don’t want the email to come off as a form email sent en masse. Have a very clear call-to-action link/button. Just as with good conversion rate optimization, have a singular goal of users clicking the review button. Include a review link in your standard email signatures. See the example below with the addition of the linked “Please review us on Google” and “Check us out on Yelp!” As you can see we aren’t asking customers to review us on Yelp as Yelp frowns on that, rather we are encouraging customers to check us out on Yelp and if they feel so inclined they may leave a review there. With Google, we have a lot more freedom to ask for reviews. 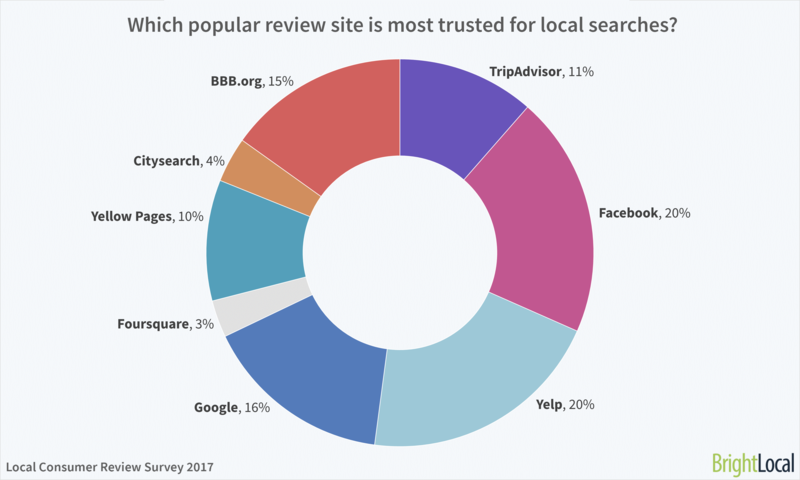 Responding to reviews is more important than ever, with 30% naming this as key when judging local businesses (BrightLocal). When you get a negative review, respond publicly and work to solve the problem. This shows that you are listening and engaged which will often encourage more feedback. When you get a positive review be sure to say thank you, customers will appreciate your gratitude and have even stronger positive feelings towards your business. For additional help and guidance on improving your local search presence or to find out more about how Anvil can further help your business grow, contact us today!